MY COUSIN, ROLAND Hart, lives in Michigan. He has a great wife and three beautiful children. The two boys are in high school and are extremely athletic, and his oldest, Josh, is looking at college sports scholarships next year. Roland's wife, Amy, put a post on Facebook yesterday that made me laugh. Seems the middle child, Drew, broke his arm snowboarding a week ago. It's the second time he's broken the arm. But it doesn't slow him down - the day after, he was shoveling snow with his good arm. Drew had surgery Tuesday to put pins in the broken arm. Most kids would have gone home and sat on the couch in front of their video games, but not Drew. "Activity for the evening? Why not hollow out the snow hill we've been building the past couple of days and build a fire in it? If I only had 1/2 the energy of Drew! All done with one arm of course. Anyone else out there have a kid they beg to just chill and play video games or something for a while?" 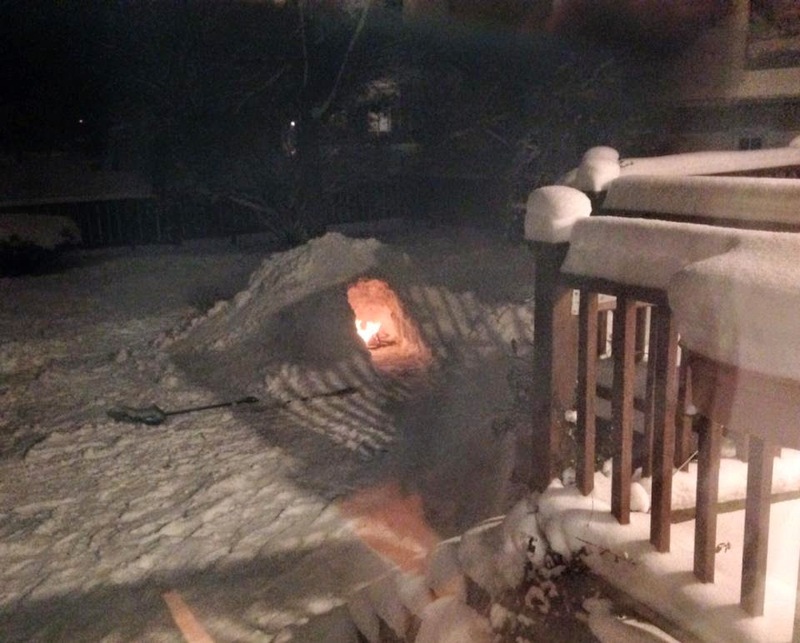 A backyard snow fort in Zeeland, Michigan. Built with one arm, of course! There is a time and place for everything, but when my guitar students come back from Christmas break, and I ask them what they got for Christmas, and they say, "video games," well, I'm in for a battle to get them to play. You go, Drew. Take care of that arm and get better, because baseball season is around the corner and you are a good player. But more importantly, Uncle Rotney will be coming to Lake Michigan again this summer and demanding a Goony Race into the lake, and you better not use some weak excuse like "I broke my arm again" and wimp out. As for Drew's parents? I know it's a challenge. But treasure these years, because you'll blink, and they'll be gone, and then it's your grandchildren who are breaking bones. And you will laugh and sigh at the memories.